Roast Chicken Legs with Garlic and Thyme is a delicious chicken recipe with obscene amount of garlic.So if you are not a garlic lover then please look away.Like for real!It has 4 big whole garlic bulbs, yes bulbs not pods. Oh I can’t tell you how amazing your kitchen will smell.It’s Magic!Period. That extra virgin olive oil and the garlic make for such a beautiful aroma ! The moment I saw the recipe of Roast Chicken Legs with lots of Garlic on Bonappetite magazine , I decided to give it a try.This is my version of it. Though the idea of roasting a whole chicken holds it’s merits, this seems more convenient to me simply because carving that whole chicken is something I haven’t quite gotten the hang of. 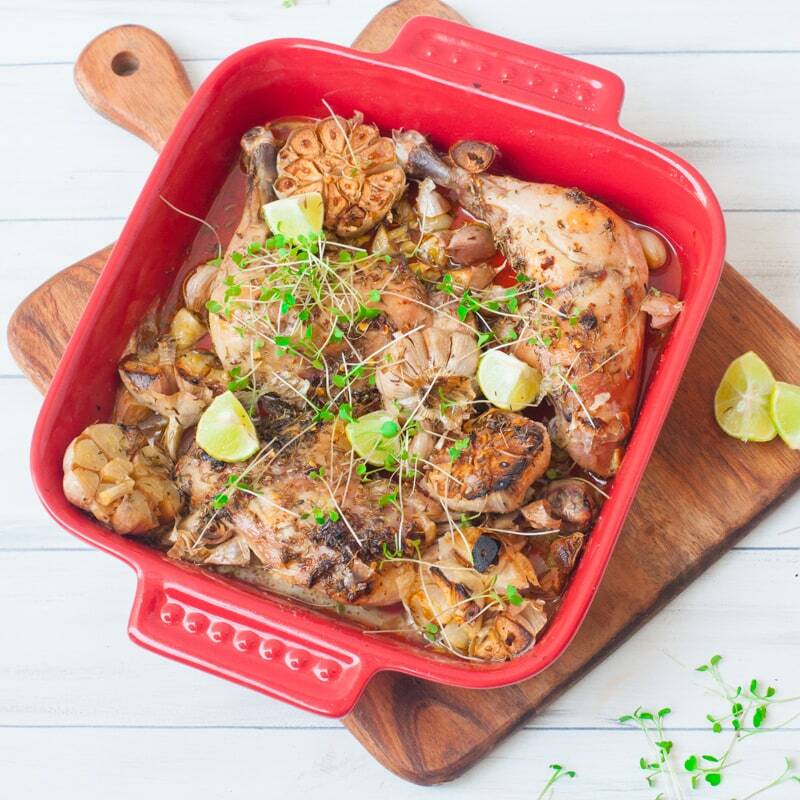 Just roasting the whole chicken legs makes serving and eating the chicken easier.If you want to healthify this recipe I suggest you use chicken thighs and reduce the amount of olive oil used.This will also considerably reduce the baking time to 30-40 minutes instead. This is a super simple handoff recipe.A few simple steps and you get the best roast chicken with a flavour punch of garlic.It’s simply bliss! Just toss all the ingredients together and slide it in the oven for a slow roast of this delicious chicken. The chicken is baked at 160 degrees till it’s literally falling off the bone in the most delicious way possible. Shall I presume much to tell you how to eat your chicken? Well eat it how you want butttt my way of eating this is by its own with the delicious juice drizzled on top and a generous squeeze of lime. Now some of us prefer a little more of a punch in their food- for folks like that- I suggest you amp up the chilli flakes and add more of it. Also, because the chicken will ooze out amazing flavour and make a sauce of it’s own, it will be wonderful to mop it up with some plain old crusty bread too. Roast Chicken Legs with Garlic and Thyme in Extra Virgin Olive Oil.Super Easy and extremely delicious Chicken recipe that we love! Mix the olive oil, thyme,salt and chilli flakes together.Pour it over the chicken. Broil it for 5 minutes on the top shelf of the oven at 250 degrees C.
Remove,Rest for 5-10 minutes.Squeeze lime juice and serve along with the delicious juice in the tray.